"I grew up with Elvis Presley's songs and movies; naturally, I was delighted when I got the opportunity to paint the official 50th Anniversary portrait of Graceland 50th Anniversary. I set up my easel at Graceland on a crisp autumn morning when the stately home was particularly cozy and welcoming. I was inspired to paint it with smoke curling from the chimney and a golden light blazing in every window." 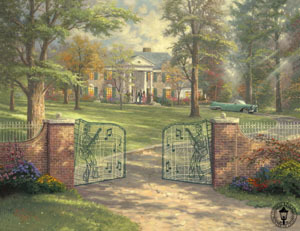 Graceland 50th Anniversary copyright© 2007 by Thomas Kinkade is prohibited from being copied. 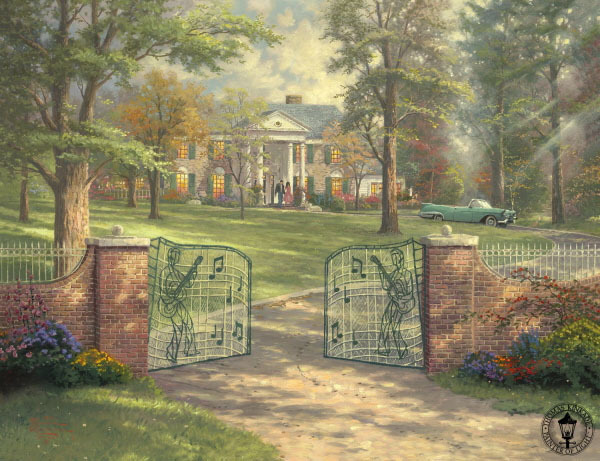 Thomas Kinkade art, graceland 50th anniversary, nostalgic houses, artwork, art work, canvases, images, paintings, pictures, and prints of Graceland 50th Anniversary by artist Thomas Kinkade for sale. Graceland 50th Anniversary painting by artist Thomas Kinkade can be purchased in art print or canvas form at special sale prices at Christ-Centered Art.